In a consumer society, LED signs are often used to advertise cheap or affordable services and products in store windows and flea markets because their low-res aesthetics and eye-catching colors easily attract the attention of passers-by. 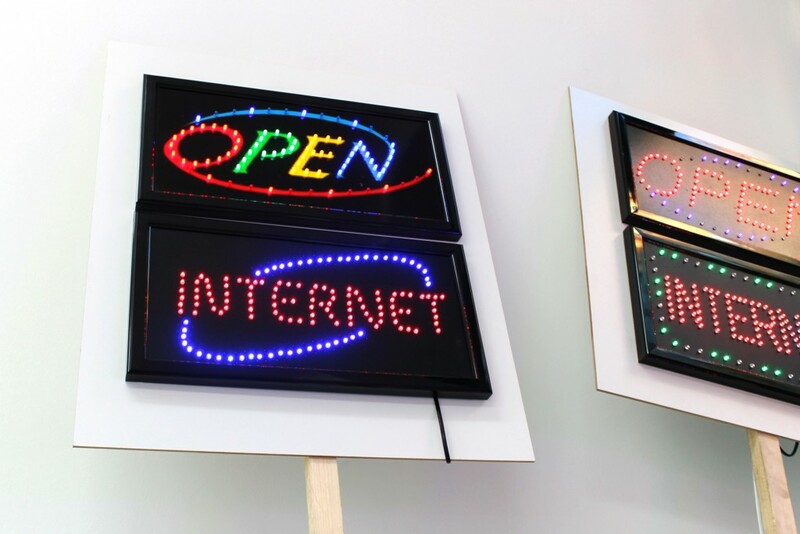 Appropriating and combining two readymade LED signs that read “OPEN” and “INTERN@T,” Bartholl refers to the frequent use of neon signs in contemporary art as a medium to express messages that can be intimate and/or philosophical (“Open Internet” as a manifesto for a better and wider Internet infrastructure and net neutrality). He also turns himself into a sandwich man by advertising his own service—an open internet network available for everyone in the surrounding area through a 3G hotspot on his mobile phone. OPEN INTERNET was produced during a residency stay at EYEBEAM. camera: Tim Clark, Claire Lacoste, Kaho Abe, thx!